Things have been moving quickly lately. In the last nine months, I’ve gotten married, ordained, and sent to serve a new church–Harvest Point United Methodist Church in Locust Grove, Georgia. There’s been so much to celebrate and also so much to do! Lately, I’ve been feeling God nudging me to slow down. And that’s when I stumbled on a beautiful and short documentary called Godspeed. This documentary follows Matt Canlis–a young pastor who wanted to achieve great things for the Kindom of God. But as he was preparing to graduate seminary, his mentor, Eugene Peterson, gave him some wise words that put him on a different path in life and in ministry. So, he and his wife moved to Scotland and began to slow down. They began moving at God’s speed. The documentary is 30 minutes, and while that might sound like a big chunk of time from your day, if you’re in ministry, it’ll be worth it. As I turn 30 years old today, I can’t help but look back at my life and be thankful. So many people, places, and moments have shaped me into the man I am. 1. Hearing the gospel presented clearly when I was a rising 4th grader at Camp Grier. I responded with excitement and it was the best decision of my life. 4. Joining my first small group at Conyers First UMC as a sixth grader. Don Swaney, Chip Russell, and Bryan Farrar were my leaders and they had an impact upon me that they’ll never fully know. 5. Getting a phone call in March of 2012 letting me know that I was going to be an Associate Pastor at Hamilton Mill UMC in Dacula, GA.
6. Deciding to go to Furman University where I followed in the footsteps of my mom, aunt, uncle, nana, and papa. Some of the best years of my life. 7. Buying my first Digital SLR camera before studying abroad. It opened my eyes to a world of beauty around me. 8. Being assigned a final exam in P.E. my senior year of high school that required me to run 2 miles in 16 minutes. I thought it was impossible. But it was the start of my journey towards being physically healthy. 9. Eating at Ms. Winner’s Chicken and Biscuits every Thursday morning for 6 years during middle school and high school. The men around the table at this prayer breakfast taught me so much about life. 10. Being invited to preach my first sermon at a Morning Watch at Salem Campmeeting. I’m sure it’d be hilarious to listen to! But I’m also sure God used that moment to affirm my calling to preach. 11. Receiving my Eagle Scout award after so many years in Scouting. 12. Fishing with my father on Hilton Head Island, SC each and every family vacation there. 13. 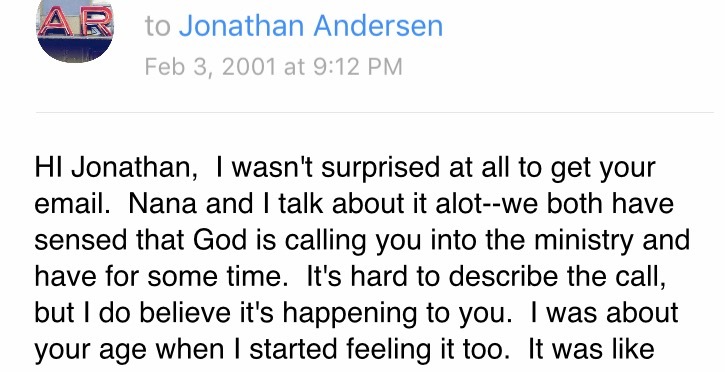 Emailing my aunt late one night in middle school about the call to ministry I had been feeling. She affirmed my call and encouraged me to keep seeking God. 14. Sitting in the car with my mom as she carted me around to all my various activities as a kid and endured my whining. She always responded with grace. 15. Being baptized as an infant at Conyers First UMC. Looking back, I know the church kept the promises they made to me in that moment. 16. Receiving a bid from the Kappa Alpha Order while at Furman. 17. Receiving an email from my friend Daniel encouraging me to continue to pursue ministry when I was questioning my call in seminary. 18. My dad chaperoning my 5th grade trip to Rock Eagle. I told him “You won’t regret it!” And he didn’t! 19. Picking up a phone call in 2013 from a local pastor asking me if I wanted to be a part of his accountability group. This group has nourished my soul in so many ways. 20. Discovering in elementary school that you could buy Airheads for pennies and sell them for quarters. 21. Don Swaney pulling me aside at church in 10th grade and telling me that it was time for me to step up as a leader in the youth group and church. 22. Receiving a phone call from my former pastor, Dr. John Beyers, letting me know that I had been approved for ordination in the UMC. 23. Having two older brothers who loved me, answered my annoying questions, and let me hang out with their friends. 25. Attending Youth Assembly in high school and discovering the fun of politics. 26. Experiencing the magnitude of God’s love in a tangible way on my Walk To Emmaus retreat. 27. Praying in Duke Chapel that God would show me where to go to seminary. Duke Divinity School it was! 28. Camping out weekend after weekend with Scouts and developing a love for the outdoors. 29. Witnessing people come to faith in Jesus Christ for the first time throughout my time in ministry! 30. Going to Harpenden, England on a mission trip in 9th grade. 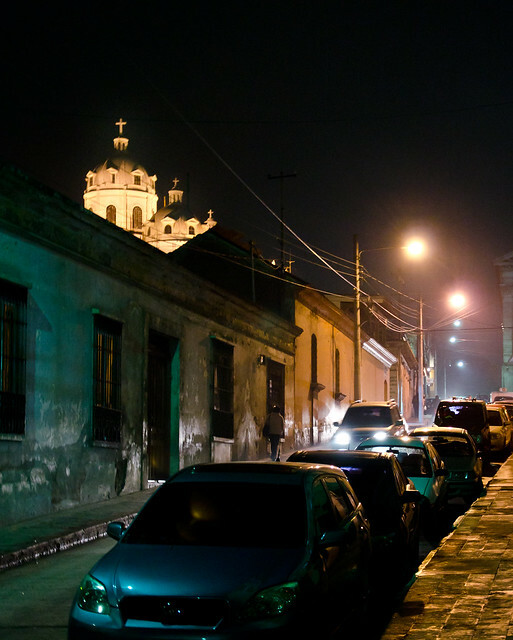 There, I first witnessed the beauty of the global church. I’m thankful to God for these moments. I’m also thankful that as I look forward to the next 30 years of my life, the best is yet to come! The last year has been full of big events! In September, I got engaged. Soon after, we (Hamilton Mill UMC) moved into our new worship center. In January, I turned in all of the paperwork that is required to be considered for ordination in the UMC. This week, after extensive interviews, the North Georgia Annual Conference approved me for ordination this June. And in May I’m getting married! I haven’t had much time to write here, so I thought I’d share some recent sermons instead. May God use them to bless you, challenge you, and grow your faith. A sermon on The Greatest Commandment found in Matthew 22:34-40. A sermon on Mary’s song in Luke 1:46-55, commonly known as The Magnifcat. Remember Zacchaeus? His story isn’t just for kids. A sermon on Luke 19:1-10. A sermon on Luke 9:51-62. The number one complaint I hear from other associate pastors is that they don’t get to preach enough. And if Tim Keller is right when he says, “the only way you’re going to be a better preacher is if you preach often,” then we associate pastors are doomed to some pretty bad sermons for years to come. But it doesn’t have to be this way. Most associate pastors passively wait for preaching invitations to come their way. But if you truly want to grow as a preacher, you can easily preach more often by actively searching for new opportunities to share God’s Word with others. Start by letting your senior pastor know that you wish you had more opportunities to preach. He might tell you that one day you’ll get that chance at your own church where you can control the pulpit each week. She might begin rotating you in more often due to your eagerness and desire to grow as a preacher, or he might welcome the feedback and keep everything as it has been. No matter the response, this helps pave the way for future conversations when you request to preach elsewhere. You likely know other pastors who are preaching weekly, and while this opportunity may seem glorious in your mind, many of them would greatly appreciate a week out of the pulpit to get ahead on sermon preparation, focus on other priorities, or take a vacation. Send a quick email to your friends letting them know that you’d love to relieve them one week and jump into the current series they’re doing or do a stand alone sermon. If they’re agreeable, make sure you clear it with your senior pastor first. While many prophets aren’t welcome in their hometown, my childhood church loves having me as a guest preacher. Congregations enjoy seeing someone in the pulpit that they had a role in shaping for ministry. It gives them a sense of pride and fruitfulness as they witness what God has done throughout the years in their church and through their church. The easiest way to make this happen is by intentionally cultivating a relationship with each new pastor of your childhood church and letting them know that you’re available. It’s very likely that your local prison has weekly worship services. They might even be at times other than Sunday morning when you’d easily be available. Reach out to the chaplain or other people connected with ministries in your local prison and offer yourself as a resource. Last time I preached at the local prison a man came up to me after my sermon and asked if he could have my sermon notes. He was training to be a preacher and wanted to see how other people prepared! While I’ve yet to preach in a nursing home, one of my friends recently gave me this suggestion. He reminded me that we preachers, like John Wesley, must not simply wait for people and preaching opportunities to come to us. Instead, we must go to them and meet people in the places right where they are—particularly the most vulnerable. What other ways or places have you found to develop your gift of preaching?